Group Discounts: 5% for two people, 10% for three or more. A limited number of special need scholarships are available. Contact registrar@gbcacm.org for details. Special Note: This seminar has a large hands-on component. It is strongly recommended that you bring a laptop computer and that you install the Eclipse IDE and seminar code samples before the seminar. The examples will be presented in Java, but the techniques are applicable to all modern programming languages. Gil Broza helps organizations, teams and individuals implement high-performance Agile principles and practices. His coaching and training clients – over 1,000 professionals in 20 companies – have delighted their customers, shipped working software on time, increased their productivity and decimated their software defects. Beyond teaching, Gil helps people overcome limiting habits, fears of change, blind spots and outdated beliefs, and reach higher levels of performance, confidence and accomplishment. In the last six years, Gil has worked with organizations of every size and industry; he has conducted readiness assessments, skills trainings, project kick-offs, large-scale transitions, on-going process coaching, retrospectives, and process fix-ups and tune-ups. Prior to becoming a consultant, Gil was an R&D manager, team leader and developer for 12 years, successfully applying Agile methods since 2001. He remains proficient in Java, C# and C++ and has co-authored an interactive eLearning course on microtesting and test-driven development. Gil has an M.Sc. in Computational Linguistics and a B.Sc. 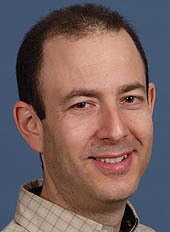 in Computer Science and Mathematics from the Hebrew University of Jerusalem, Israel. He is a certified NLP Master Practitioner and has studied organizational behaviour and development extensively. He has written several practical papers for the Cutter IT Journal, other trade magazines, and for conferences, winning the Best Practical Paper award at XP/Agile Universe 2004. Gil co-produced the Agile Coaching stage for the “Agile 2010” and “Agile 2009” conferences. "Outstanding exercises. Gil was extremely clear." "Gil did a much better job of explaining the context/purpose of these practices than other presenters I've seen." "Well thought out and detailed seminar." "Gil is a great speaker and prepared very well." "I took a 1 day course in TDD (Test Driven Development) a little over a month ago. I got more out of this even without knowing Eclipse & rusty at JAVA." "Excellent instructor, giving practical examples, able to field questions successfully." "Good labs. Small enough but not too small." "Very informative, interactive, useful skills!" "Gil was great. Very informed and helpful." "Gil made complexity accessable! Extremely well though out." "Gil was fantastic. Great handouts, pre-work, presentation, on-his-feet answering questions..."
On the other side of the microphone, Gil was extremely impressed with the people attending the seminar. This was the largest single group he has taught, and everyone was fully engaged and participating for the entire two days. He said that he had never seen a group where everyone was sofully committed to learning. Must be something in the Boston water! In addition to the technical content, Russell Doty of GBC/ACM presented some snippets on the soft side of The Journeyman Programmer. These were intended to stimulate discussion, and did just that! Some people found the concepts enlightening, and some strongly disagreed. A few people asked for the slides, which are attached here. Finally, we promised to continue the conversations started in the seminar. We are doing this in our blog at TheJourneymanProgrammer.org. Please stop by, see if there is anything interesting, and join the discussion. Well, we have our first bug fix - there is a bug in one of the lab exercises! The zip file containing the lab exercises has been updated. If you have previously installed the lab exercises, the corrected file is available by itself at Lab-LabelMaker-SolutionAfterLongParameterList-Java. There is a better way - a sane approach to dealing with both new code and legacy code. A framework for bringing order to code chaos, for making changes to existing code that are actually improvements. 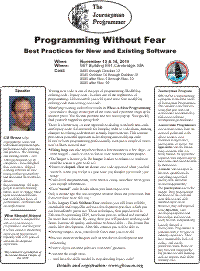 And this seminar provides a powerful approach to developing and modifying code. Fixing bugs can take anywhere from a few minutes to a few days - or even longer! - and is even less fun in code written by other people. The larger a feature gets, the longer it takes to enhance or maintain (and the scarier it gets to do so). However elegant, clear or clever your code appeared when you first wrote it, when you revisit it a year later you shudder (or scratch your head). Code-level documentation, even when it exists, somehow never gives you enough information. Even “tested” code breaks where you least expect it to. Only a decade ago this was accepted wisdom about our profession. But it doesn't have to be this way! In this Taming Legacy Code seminar, you will learn reliable, sustainable and enjoyable software development practices which you can immediately put to use. These techniques, first popularized in Extreme Programming (XP), have been proven, refined and extended for more than a decade. By using them you will produce working code faster, increase its quality, and reduce technical debt — the demon that snarls later development. … And have the skills needed to stop dreading legacy code! Code smells. Just as programmers can leverage design patterns and good Object Oriented (OO) practice to produce excellent code, they can know what sort of code to avoid. This knowledge has been catalogued and codified as a few dozen anti-patterns called “code smells”. Methods so long as to require scrolling, classes that have too many disparate responsibilities, and primitives that carry meanings are but three examples of code smells. We will study about a dozen common smells that occur within methods or classes. By studying these anti-patterns you’ll get a better sense of the code you do want to write, and develop your “nose” for finding low-level design defects so that you can more easily remove them from your code. Low-level refactorings, such as Extract Method and Compose Method. These refactorings alter a few lines of code often in the context of one or two methods. They are quite mechanical in nature, to the extent that modern tools like Eclipse have automated them almost entirely. High-level strategies, such as Gradual Cutover, which combine several low-level refactorings to make refactoring safe and reliable. If you’ve ever had to make medium- to large design changes, perhaps some of your unit tests began to fail, or the code didn't even compile for a few hours; these strategies will help you avoid this scary zone. Microtesting. Commonly called “unit testing”, this is the art and science of writing focused, quick, extremely low-level tests against your code to prove that it does what you think. By writing many of these microtests against your code, you will be able to develop it predictably, introduce far fewer defects, and spend a lot less time debugging now and later. However, the trap of microtesting is that you may develop brittle tests - tests that are difficult to change and subject to many of the same problems as the code you are working on. You will learn what makes great microtests and how to produce them. Test-driven development (TDD). The TDD process is the best thing you can do when writing new code, be it small or large. TDD combines microtesting, small code increments or changes and merciless refactoring to have you write great code without fear. Remember when you would write a few dozen (or a hundred?) lines of code, start testing them, then fix the bugs you found? And remember that it was impossible to estimate (guess) how long finding and fixing the bugs would take? That is a thing of the past with TDD. Dependencies. Most objects in most systems don’t work in isolation; they depend on other objects. Sometimes these dependencies (a.k.a. collaborations, interactions) make testing difficult, unreliable, slow, or ineffectual. Still, that’s no reason to avoid microtesting and just do slow end-to-end testing! You’ll learn how to ensure the speed and fidelity of your microtests when dependencies are present. You will study techniques like faking, stubbing, mocking, and dependency injection. You will practice keeping your tests sharp while testing the contents and process of the interactions themselves. For a Journeyman Programmer, you will move from hacking at the code - perhaps creating more problems than you solve - to code craftsmanship. "Storytest-Driven Development", tuturial (with Max Baumann) at Agile 2005, Denver, CO. This seminar is designed for software practitioners, programmers, and designers. It is best suited to moderately experienced programmers, typically with 2-10 years of software development experience. If you identify gaps in your knowledge and practice, when do you pay attention to them? I believe self-development takes great commitment and the incorporation of slack in your schedule. It's not something you "just get to" as with the rest of the stuff in your personal backlog. You need to spend the time closing conscious gaps (what you know that you don't know) as well as unconscious gaps (discovering what you don't know). That's one reason I love group programs of any kind. Their structure fosters accountability and helps me recognize my gaps. My favorites are community conferences (not just lectures) and live training events. Beyond supplying information and data, the frequent peer interaction is motivating, mind-opening, and exhilarating. Your registration includes a two full days of presentations and workshops as well as lunch, a continental breakfast and snacks each day. Students graduate from college with a substantial base of theoretical knowledge, but a limited based of the practical knowledge needed by industry. Journeyman comes from the world of guilds and crafts, where workers were classified as apprentice, journeyman, or master. An apprentice was the lowest rung, someone who was being trained. An apprentice required close supervision on most tasks, and could do little by themselves. A master was an expert at the craft, qualified to do everything, supervised journeymen, and often worked independently. A journeyman was in the middle. They had mastered the basics of the craft and were able to work with minimal supervision. However, they still required some supervision, were developing expertise and knowledge, and were not ready to work independently. Loosely defined, a Journeyman Programmer is someone with 2-10 years of industry experience. They have mastered the basics of coding, and can do productive work. However, they have not mastered the big picture, are still learning, and can improve their skills in many areas. GBC/ACM is implementing a program to meet the needs of Journeyman Programmers. This seminar is the first in a series that deal with real world issues encountered by mid-career software developers.